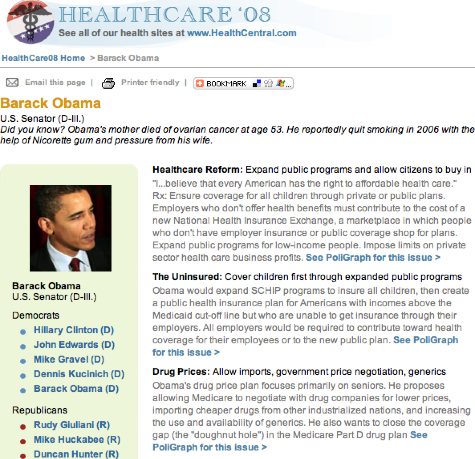 Craig Stoltz, former health section editor of the Washington Post, pinged me about a projected he just finished with HealthCentral — HealthCare08, featuring the PoliGrpah, a dataviz (data visualization), i.e. 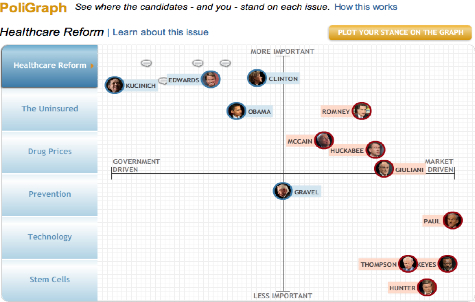 flash + database, which plots each presidential candidate’s position on key healthcare issues. Which of course got me thinking why I haven’t see more of this type of journalism from newspapers and other news organizations. You can mouse over each candidate and see their position, and also click through to see a whole rundown of their positions. When I asked Craig for his thoughts on the site, it was notable that his first response was all about the journalistic process — which is as it should be. If it had been a two-page spread in the Washington Post newspaper, he wouldn’t have commented on the type of ink used, the software the news designers used, or how the printing presses were run. Any news organization who looks at this site and wonders first about the technology is not just behind the curve on innovation — they are behind the curve on what are increasingly fundamental tools of journalism. The journalistic process, frankly, is one of the most rigorous I’ve ever had to do, and that includes my 12 years at The Washington Post. To plot a candidate’s position with some accuracy and intellectual honesty, you need (a) a methodology to determine what kind of statements, actions, voting record, etc. you’ll take into account to place them on a graph; (b) a very ambitious effort to gather data completely; and (c) the willingness to spend long hours parsing it and figuring out whether (say) two votes against gun registration outweigh a strong rating from the gun control community. This requires brain work. We did not interview candidates or staff. We decided that the public record was likely a more accurate, telling source of what a candidate really believes than anything they’d say to spin our staff. Others may disagree with this approach. This type of journalism does not require much writing. 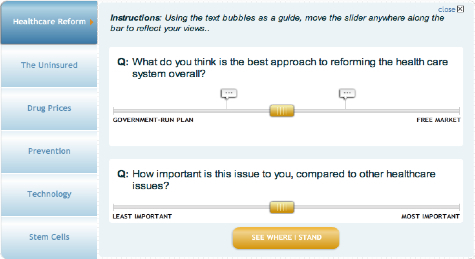 The real work is in smart people analyzing data and the team finding ways to present it visually. This is journalism without pithy quotes, gotcha moments, spin vs. counterspin, etc. I’m not sure what precisely the skill set is–a taste for digging, a facility with Excel, a talent to imagine how differences “look” instead of “read.” A familiarity with the Flash guy who sits in the dark cube with the funky lamp helps too. The output (I argue) is far more engaging–and therefore of greater civic value–than much bigger volume of quotage, paragraphs of explanation, facts delivered in sentences or even charts. This isn’t just pushing data at people in a visual way. By inviting them to take a quiz and see themselves on the same graph, I dare say we almost make the issue of, say, approaches to drug price controls fun. The approach itself is full of possibilities for journalism of many types. We used a left-to-right axis because most healthcare issues on the national level break down that way. But for a local election–let’s say you’re comparing mayoral candidates–the axes should be very different: support-vs.-control development; tax incentives for growth vs. regulations; gun control vs. 2nd amendment, etc. So here’s my thought — wouldn’t it be great if every newspaper in the country could create an application like this that graphs each of the presidential candidates against issues of local importance? And probably more important, as Craig suggests, newspapers could do this for state and local elections. Shouldn’t such a technology-enabled voter education tool, based on solid journalism, be as fundamental to every newspaper as traditional campaign coverage and a candidate endorsement on the editorial page? I feel like until you have this talent in house and part of the creative team–present from the moment of conception– you’ll keep assigning and publishing 45-inch articles on stem cell research. Trees, readers, newspapers all continue to die. Happily, I think the budget realities of newsrooms today create a great opportunity for managers. Next time a journeyman Metro reporter takes a buyout, replace her with a database or Flash resource. Choices like that can drive transformation that will help the newspaper survive, maybe thrive, in the coming era. Hiring another Metro reporter won’t. In its day, the printing press was a powerful tool for technology-enabled journalism. Technology evolves — rather quickly of late — and so too must journalism along with it. And to those who have rightly lost patience with merely talking about the need to change, here’s a great example — follow it.